GET ONE NOWWAIT, I WANT TO KNOW MORE. See it. Pick it. Launch it. Updating your website is now as easy as online shopping. Look through all the blocks available. Testimonials, About, Contact and much much more. Pick a new block or page that is going to add that special something to your website. Easily upload the files to your site, tweak the text and hit save. It’s that easy keeping your site fresh. Playing with the template now and oh my god, I wish I’d found you sooner! GRAB YOUR FREE PRICING TABLE! Updating your X Theme website has never been easier! 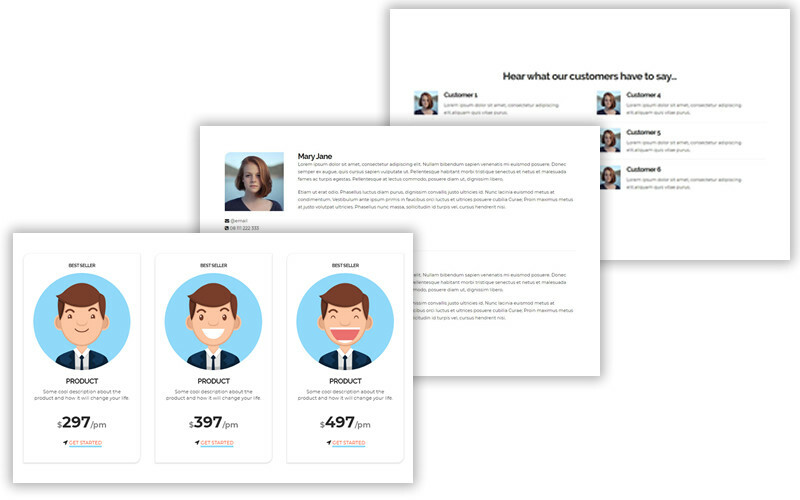 Cornerstone, their page builder, makes keeping your website looking fresh so simple. A fresh look is key to keeping your online clients interested in visiting your site. Need a cool testimonials section? No problem. Need some creative new way to show your contact details? There is a Cornerstone block for that. When you checkout you’ll instantly download a zip file containing everything included for the block. This is the custom file type that Cornerstone use. It has the element details for the block. CSS is a styling language browsers use to decide how an internet thing looks. You’ll get this code to add to your site. Videos are the easiest way to be shown a new skill. There are a range of short videos that guide you through each step of installing your new block. Pick the blocks you need! You'll need a few things before you can start buying blocks for your site. Firstly, a website. Blocks are not websites. They are sections of web pages. Your website needs to be Wordpress (download it free here) and have Cornerstone from Themeco theme activated (buy a licensee here). NEED HELP GETTING SETUP? NO PROBLEM! I want to help business owners build websites the right way, at an affordable price. – Jon Schreyers – Web developer and Founder of WP TEMPLATES.